The guide, a selective and systematic look at more than 300 colleges and universities in the United States, Canada and Great Britain, is published annually as a resource for college-bound students and their families on which to base their educational choices. Institutions selected for inclusion are profiled on a broad range of subjects, including student body, academics, social life, financial aid, campus setting, housing, food, and extracurricular activities. In a profile of Lawrence, Fiske cites the college for its “eclectic approach to learning that attracts interested and interesting students from around the world.” The guide also highlights Lawrence’s commitment to individualized learning, the expertise of the faculty and its broad, off-campus study opportunities. a listing of schools that no longer require the SAT or ACT of all applicants, of which Lawrence is one. 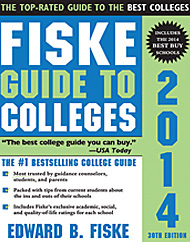 Fiske, who spent 17 years as education editor of the New York Times, compiles his guide as a tool to broaden students’ horizons about American higher education and help them select the right college that coincides with their particular needs, goals, interests, talents and personalities.